I think there are two important things to tease out here, firstly a critical analysis of the problems and merits of peer review, and secondly a close look at how it could be improved, modified, or replaced. I think these merit separate posts so I’ll start here with the problems in our traditional approach. One thing that has really started to puzzle me is how un-scientific scientists are about the practice of science. In their own domain researchers will tear arguments to pieces, critically analyse each piece for flaws, and argue incessantly over the data, the methodology, the analysis, and the conclusions that are being put forward, usually with an open mind and a positive attitude. But shift their attention onto the process of research and all that goes out the window. Personal anecdote, gut feelings, half-baked calculations and sweeping statements suddenly become de rigueur. The key here is “…apart from all those other[s…] tried from time to time…”. 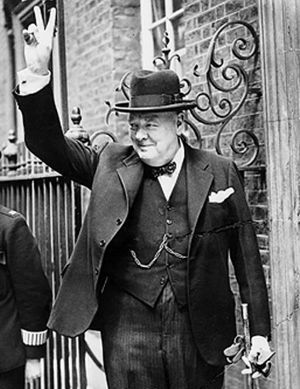 Churchill was arguing from historical evidence. The trouble is when it comes to peer review we a) have never really tried any other system so the quote really isn’t applicable (actually its worse than that, other systems have been used, mostly on a small scale, and they actually seem to work pretty well but that’s for the next post) and b) what evidence we do have shows almost universally that peer review is a waste of time and resources and that it really doesn’t achieve very much at all. It doesn’t effectively guarantee accuracy, it fails dismally at predicting importance, and its not really supporting any effective filtering. If I appeal to authority I’ll go for one with some domain credibility, lets say the Cochrane Reviews which conclude the summary of a study of peer review with “At present, little empirical evidence is available to support the use of editorial peer review as a mechanism to ensure quality of biomedical research.” Or perhaps Richard Smith, a previous editor of the British Medical Journal, who describes the quite terrifying ineffectiveness of referees in finding errors deliberately inserted into a paper. Smith’s article is a good entry into to the relevant literature as is a Research Information Network study that notably doesn’t address the issue of whether peer review of papers helps to maintain accuracy despite being broadly supportive of the use of peer review to award grants. Now does this matter? I mean in some ways people seem to feel we’re bumbling along well enough. Why change things? Well consider the following scenario. I mean seriously? They’d be ripped to shreds in moments. What if this happened within government? The media would have a field day. What makes us as a research community any different? And how are you going to explain that difference to taxpapers? Lets look at the evidence, see where the problems are , see where the good things are, and lets start taking our responsibility to the public purse seriously. Lets abandon the gut feelings and anecdotes and actually start applying some scientific thinking to the processes we used to do and communicate science. After all if science works, then we can’t lose can we? Now simply abandoning the current system tomorrow is untenable and impractical. And there are a range of perfectly valid concerns that can be raised about moving to different systems. These are worth looking at closely and we need to consider carefully what kinds of systems and what kinds of transition might work. But that is a job for a second post. Other systems certainly have been, and continue to be tried. As examples, what about the court of public opinion as a filtering/review system (see the immunization/autism controversy). Or as rpg, who comments below, notes in a recent blog posting(http://blog.the-scientist.com/2011/01/20/politik/), The Third Reviewer, which seems to have withered on the vine as a review mechanism. PLoS’ numbers for post-publication review offered in their article level metrics suggest a generally unreviewed literature if that was the sole method employed. Looking forward to your suggestions for better filtering methods. 1. Stop incorrect science being disseminated. That’s too much to ask of any system. I could probably devise a very efficient way to achieve one or maybe two of the above, but all of them at the same time is an impossibility. As an editor I use peer review and have always used peer review for one thing only, to provide me with advice from people more knowledgeable than I about a particular area of science. And I need that advice so that I (and my editorial colleagues) can make a decision about which reports of research are most appropriate to be presented to the readership of my journal. It also gives me advice to help the authors make the paper more appropriate for my readership than it currently is. Peer review is brilliant at doing that. Well some quick easy answers on alternatives to traditional peer review. ArXiv (the sky doesn’t seem to have fallen in for the physicists), F1000 seems to be doing ok tho I think the model is somewhat flawed, and Atmospheric Chemistry and Physics have a publish first, peer review later, approach which seems to be working ok for them as well. I think the Wakefield paper is a peculiar example for you to choose though as it was an abject failure of both peer review and editorial view followed up with extensive post publication peer review, tests and a lot of hard work. This is exactly the kind of review that does work. Public, principled, and closely argued. The behind closed doors approach failed here. The fact that that review happened in the peer reviewed literature for the most part doesn’t actually damage my argument from my perspective. The question is whether we could have done that post-pub review more effectively and efficiently. I think the answer is yes, had their been a massive response quickly to that paper with good evidence and good argument then maybe the court of public opinion wouldn’t have gone off the rails. Ok, so you seem to be using it for two things here :-) On the second, the “improving papers” argument I can’t currently lay my hands on it but I think there has been one study on this that failed to show any improvement. Hard study to do obviously but it would be worth pinning this down. The trouble is that you’re falling back on personal anecdote again and I’m suspicious of that. Yes you get some different opinions, but how often are they the right opinions? How often are they accurate, and if you are by definition not in a position to tell how does that help us? These are tough questions but the only objective evidence out there suggests no effect (actually my reading of the evidence is that professional editors are much better at these jobs than peer reviewers). Against this we have “but I know it works” which sounds rather like the argument for homeopathy to me. But bottom line, yes, we should be designing systems explicitly and then checking that they are doing what we intend them to do. That’s the key. Applying scientific approaches to science. I’ve got to say, I’d much rather be wrong here than right. It would make our lives a lot easier. I still think there are options for improving efficiency but if we knew what peer review really was good for we’d at least have a starting point. Chris, which of the factors in your list of 7 go into your decision about which reports of research are appropriate to be presented to the readership of your journal. I’m thinking it’s likely 1, 2, 3 and 6. How would Nature Protocols handle a manuscript that came back with a review stating that the paper was incorrect, fraudulent, of little interest to the community and poorly written? While not perfect, as an article published by your employers notes (http://www.nature.com/emboj/about/emboj_rejects_2007.html) peer review is pretty effective at doing what it’s supposed to do. I don’t really know of any journal that asks reviewers to assess question 4, given the speed of scientific progress. Seriously, what was the last paper from 1991 that you read? 5 and 7 are not failures of peer review, but instead are failures of the tenure and grant review processes. Although the track record of a candidate to produce results is and should be factors in such decisions, and their publication record is one way of assessing it. I do agree with much of what you’ve written, that assessing research is much more complicated than a simple and deeply flawed metric like the Impact Factor. But given the “brilliance” you see in peer review, are you really in complete agreement with Cameron that it should be eliminated, that it has no measurable value, and that everything should be published and sorted out after the fact? It seems like you’re making a very different argument than he is. Nicely put, Cameron, and entertaining as ever. I think your attacking a straw man by picking on the Churchill quote, though: surely most people just include it as a way of adding a little colour their writing and to sum up the general feeling among the majority of researchers, rather than seriously citing it in support of the present system? I’ve just written a overview of the current state of peer review hopefully (subject to their peer review) to appear in a forthcoming issue of New Review of Information Networking (http://mrkwr.wordpress.com/2011/01/28/is-peer-review-in-crisis/). For what it’s worth I managed to avoid quoting Churchill. By the way, I’m sure it’s easy to find example of people misquoting Churchill but I checked the various sources that I cite and in fact they all correctly quote him. A lot depends on what you think peer review is for. You quote the Cochrane review which says there is no evidence that peer review improves the quality of biomedical research (though you omit the bit where they say that the absence of evidence isn’t the same thing as evidence of absence, I note). But is improving research the purpose of (journal) peer review? I’m more inclined to Chris Surridge’s position, that for publishing (peer review for grant applications is a different matter) peer review helps improve the published paper. In the PRC report you mention, we found that authors overwhelming said that review had improved their last published paper, so perhaps researchers are not being as irrational as you suggest in support peer review? admit it drives me up the wall because it is so intellectually lazy. somewhat lazy attitude to even seeing what the evidence is. to be proven wrong, at least in some aspects of this! papers (I’d guess around another $10M, based on one person day per paper). again would be interesting to estimate those potential costs. get charged coming and going. interested in seeing what you’re view on that is. Maybe I should have said earlier, but I’ll say now that of course my views are mine and not supposed to represent that of my employers (Nature Publishing Group at the moment). As you say I chiefly look for advice on 1,3 and 6. Fraud I tend to leave to one side as from what I get to work with as a journal editor it doesn’t look much different from studies that have been honestly messed up: the data looks ‘wrong’ in some way. As to looking onto the future I think that peer reviewers are always being asked to spot Nobel prize work or studies that will open up a wholly new field. The question might only be implicit but it is always there. I don’t disagree with you David. I think what I was trying to say was that Peer Review has been developed by scientific journals to help them decide what to publish in a times of increasing demand (more and more research wanting to be published) and restricted supply (a conventional journal can only publish so much). It is pretty good at this. The problems come when to much reliance is placed on journal publication to shape peoples careers and guide decisions about the assigning of large quantities of public money for research. I’m drifting off topic. I agree with Cameron that post-publication review of research has always played an important part in the culture of science, however traditional channels for this are too slow (discussion/citation in subsequent published papers) and too exclusive (individual conversations within labs/at meetings). To me it isn’t a question of replacing Peer Review with post-publication review, but how can we make fast and inclusive (Open even) review an integral part of modern science.